Last night S. and I went to the Chicago Theatre to see Cirque Du Soleil's Banana Shpeel and I feel in love again with magic. Once the show started, I forgot all time, space, anything that would or could possibly happen outside those walls. I was a kid again, giggling at the corny jokes, gasping at the amazing acts, dazzled, beguiled, and then disappointed when the curtain fell. See, I never wanted the show to end. I could have stayed there, fixated for days on end. And then afterwards, I asked S. "Do you think they're eating and trying to come down after tonight?" See, having worked the line, I too have had to wear down an adrenaline filled shift. I'm sorry, but would you like a Christmas cookie? First of all, I must apologize because this might be my lamest post yet. How lame? About as lame as the "snow" we're getting "all weekend." Yeah. Exactly. While my friends post on Facebook how they're playing in piles of snow with their kids, I'm walking to work and home in light, misty condensation, cursing the weatherman. He's getting nothing from me this year (like he has every year). My second apology is for not photographing the candies I made. 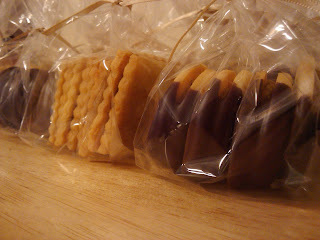 Nougat, Darjeeling Tea Caramels, and Pecan Toffee, one side covered in dark chocolate, the other, milk chocolate. I went to Paper Source and bought card stock, ribbons, sticker seals, the works. I cut squares, made paper cones, and put candies in, closed them with many things that didn't work for the most part, shipped off some goodies, and passed out the rest. Yeah, they were cute, but I've got a lot of fine tuning to do. I got home from work to find this photo from my mom in my email. It really made me laugh as remembered our Thanksgiving. See, S. and I went to Texas where he met my family-with the exception of my dad-for the first time. Well, my parents and I are Pescetarians, but we had other family, who, along with S. eat meat, so we decided to roast a hen for them, salmon for us. 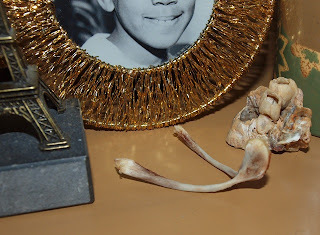 At some point, I asked S. where the wishbone was on the carcass and he helped me find it. I cleaned it up and took it to my mom. See, when I was growing up, that was my favorite piece of chicken. After dinner, my mom and I would make a wish and break it. Another childhood memory is the experiment where we put a wishbone into a jar with vinegar. After a few days, the bone turned to "rubber." It was nice laughing and sharing memories with my mom. Today has been a semi-lazy day for me. I haven't been out of the house today (it's quite chilly and I did see a few flurries outside the window), but I have been busy with research, cleaning, baking, and dessert planning. 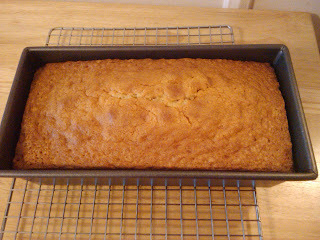 Craving something sweet, I decided to make a browned butter pound cake since it has been on my to-do list and I had browned some butter about a week ago. 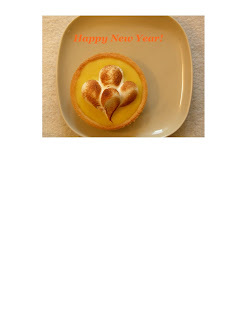 I got the recipe from another blog, Su Good Sweets when I came across it during a search. It was quite a tempting recipe, but I was busy with other projects, so I bookmarked it for a later day. I can't sleep. Or more accurately, I woke up way too early (4:30-ish) and can't go back to sleep. Yeah, I know, it's not fair, but what am I to do? So, with nothing good on tv, I've been online looking for more packaging ideas for my Christmas goodies. Well, I have ideas, but I think I'm looking for inspiration to perfect what I already have. I want to fine tune a few things.